A new statue was recently unveiled by the Museum of Popes of Jesus Christ based on the markings on the Shroud of Turin. The Shroud of Turin is a linen cloth bearing the image of a man who appears to have suffered physical trauma in a manner consistent with crucifixion. It is kept in the royal chapel of the Cathedral of Saint John the Baptist in Turin, northern Italy and goes on display every 10 years. It is believed to be the burial cloth of Jesus Christ. 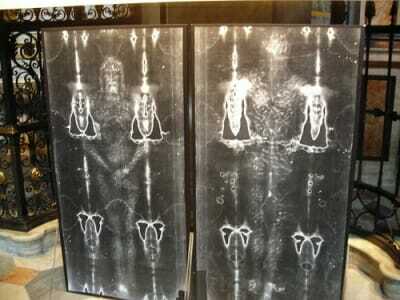 Scientists believe the image on the Shroud of Turin, thought to be the burial shroud of Jesus Christ, was created by an ultraviolet “flash of light.” However, this technology was not available prior to the 20th Century. The new statue shows the wounds on the man in the shroud who is believed to be Jesus Christ. The statue was constructed after more than two years of anatomical studies by scultor Sergio Rodella. The Shroud of Turin is a centuries-old piece of cloth believed to have been used to wrap Christ body when placed in the tomb. According to tradition, the cloth contains the imprint of Christ’s body. After studying and constructing a statue of the man from the Shroud, sculptor Sergio Rodella, wrapped a copy of the cloth around the model to see if it accurately matches in its depiction of the man. Ivan Marsura, Director of the Museum of Popes, says many other models hypothesizing the possible man from the Shroud have been more artistic than scientific. According to Ivan, this new statue supports centuries of studies, and also may help to understand if the Shroud is a fake or a real relic. The construction of this statue has even helped historians obtain new information about the man from the Shroud of Turin. The statue was constructed after more than two years of anatomical studies. Three times Rodella was forced to demolish his model and rework it. This was to ensure the most accurate representation of the man from the Shroud. Sergio first constructed an iron skeleton model and used virtual reconstruction with computer-aided design. He even used negative photographs of the Shroud, mathematical grids and transparent paper to more precisely identify the wounds and scourges this man suffered.